A few more days and 2016 will leave space to the International Year of Sustainable Tourism. The assembly of the Organization of the United Nations has decided that 2017 will be dedicated to tourism that respects the environment and local communities. We grasp at the chance and begin our journey into the new year reminding our readers why it is important to travel in a conscious and green way. Tourists traveling around the world are many and will grow exponentially in the coming years and, although this brings great economic and social benefits, it has a great impact on the environment. It is estimated that the tourism industry is the fourth largest source of pollution in Europe, mainly because of transport and CO2 emissions related to the accommodations. 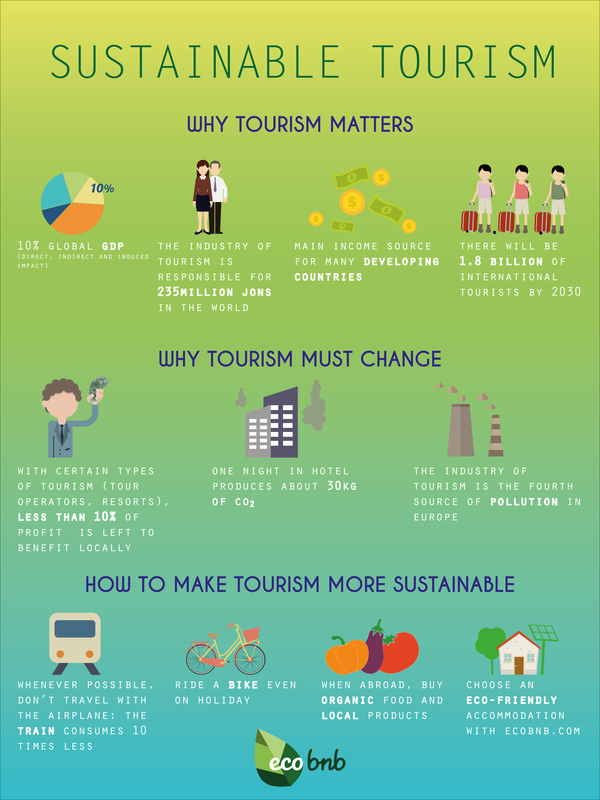 With this infographic we briefly explain the importance of sustainable tourism and how necessary is that all of us change the way we travel. This is not fundamentally change habits or give up the comforts, but make informed choices that also allow you to live more authentic experiences. This entry was posted in go green and tagged ecology, ecotourism, respect for the environment, responsible tourism, responsible travel, sustainable tourism. Bookmark the permalink.